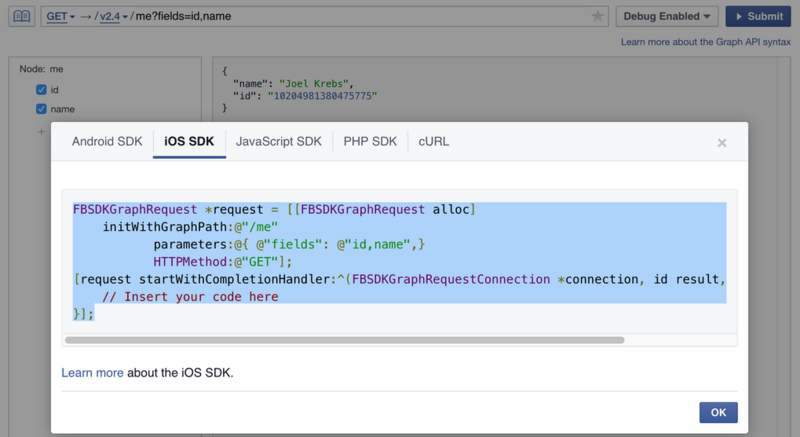 Facebook says one of its most popular developer tools is the Graph API Explorer, which lets them authenticate, make API requests and debug. The company has been actively seeking feedback on the tool to come up with improvements, and on Tuesday it announced some new features. The new features are aimed at improving the experience for code generation, history/favorites, and the interface. On the favorites/history front, developers can now interact and replay requests in the Graph API Explorer with both methods. By using history, you can retrieve recent method calls from your app admin and developer devices to be able to replay them directly in the tool. With favorites, you can bookmark important or frequently used requests. “In an effort to simplify interactions with our tools, we’ve also streamlined two commonly used features in the Graph API Explorer interface,” Facebook says. The HTTP request method, version selector, and path have been combined into one component. Additionally, the Token Debugger tool has been combined within the Access Token section. Facebook says this should eliminate the need to switch between browser tabs when debugging access tokens. Developers will no doubt appreciate this. The company is continuing to seek feedback on the Graph API Explorer for future improvements.